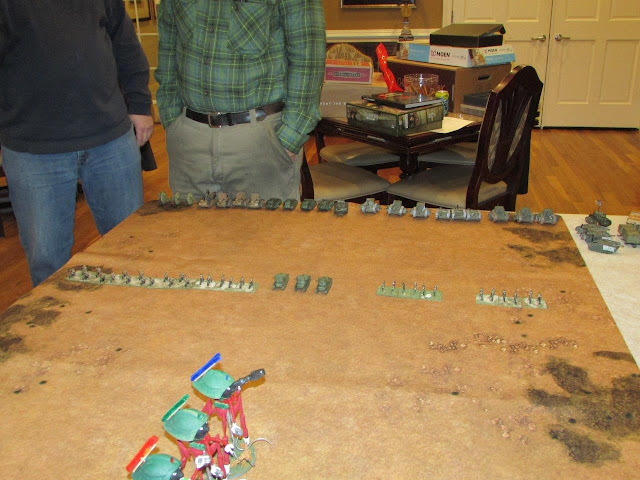 Tyler Defenders: 3 companies of infantry, 2 companies of heavy infantry, 1 command company, 1 heavy machine gun company, a battery of field guns and an anti-tripod gun. 9 units, broken if 5 units are destroyed. Texas 3rd Armored Brigade: A command tank, 2 platoons each of Mk III's, and II's. A platoon each of Mk I's, Whippits, Longhorns, and Monotanks (Formally BEF equipment, which were recovered after the battle of Bruce Mines). 4 companies of motorcycles, 3 companies of infantry, 2 companies of heavy infantry, 1 company each of heavy machine guns and mortars. A battery of Texas Tea Tossers. 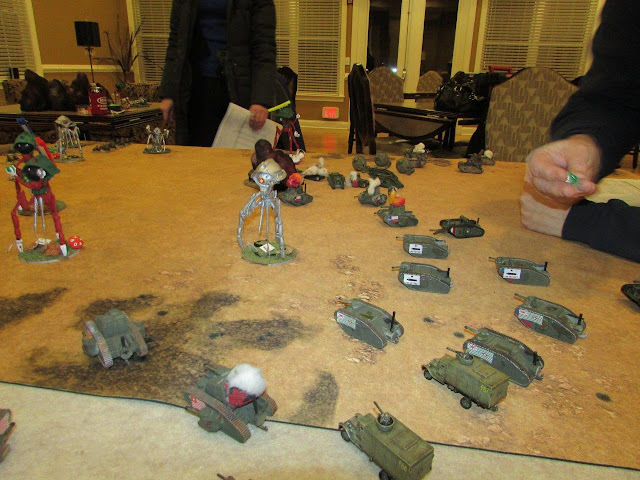 All infantry are deployed on trucks. They have 20 units, and are broken if 10 are destroyed. About 2,800 points. 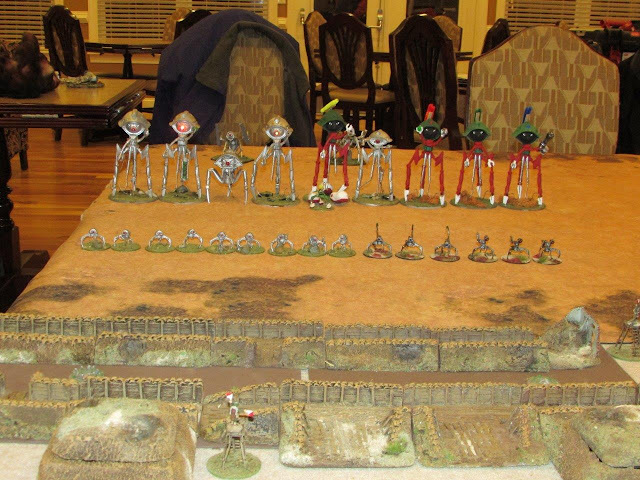 फली 19, हाइव 4, the mobile forces of Pod 19, Hive 4: A total of 11 tripods, 7 Assault, 2 Grenadiers, a Slaver and a Scout. Supported by 15 drones. The Tyler defenders are compressed together in a 2 square foot area in the south west corner of the board. The Tyler defense zone is entirely fortifications giving them +4 defense and +4 armor anywhere in that area. 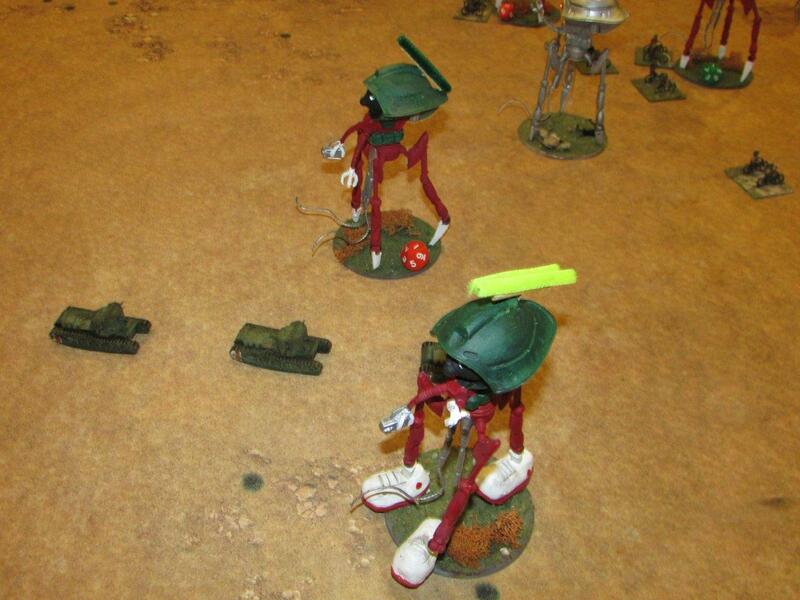 They are deployed as 16 hidden marker counters, otherwise known as blips. 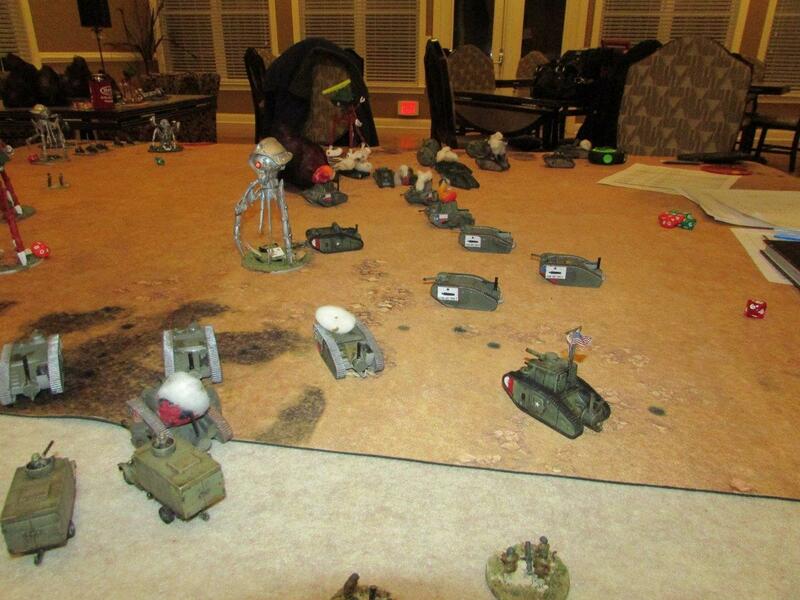 The Texas 3rd Tank Brigade deploys on the east edge of the board. 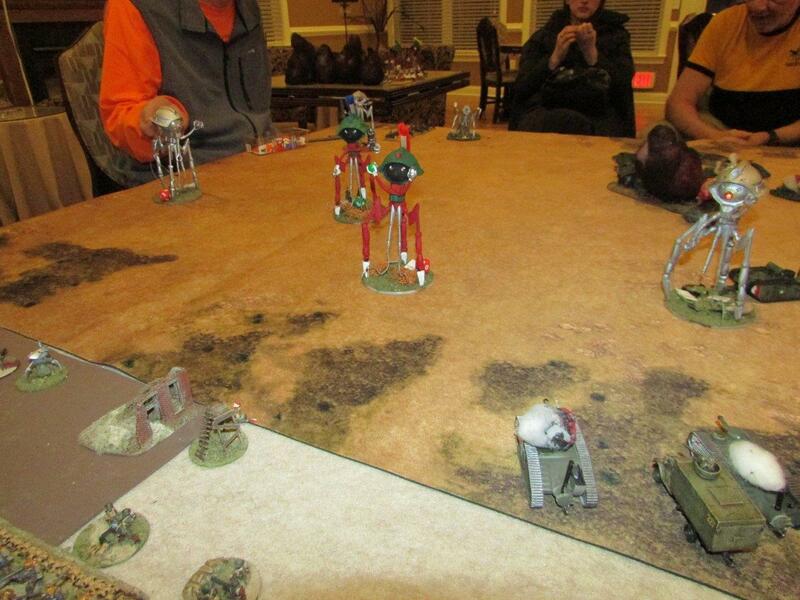 Their scouting forces, the Motorcycles and Whippets, are 2 feet into the board at the start. All other forces must arrive from off the edge of the board. 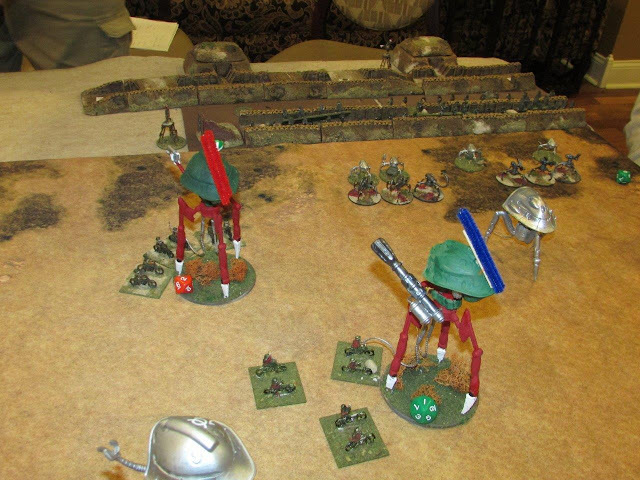 The Martians start in range of the Tyler defenses. 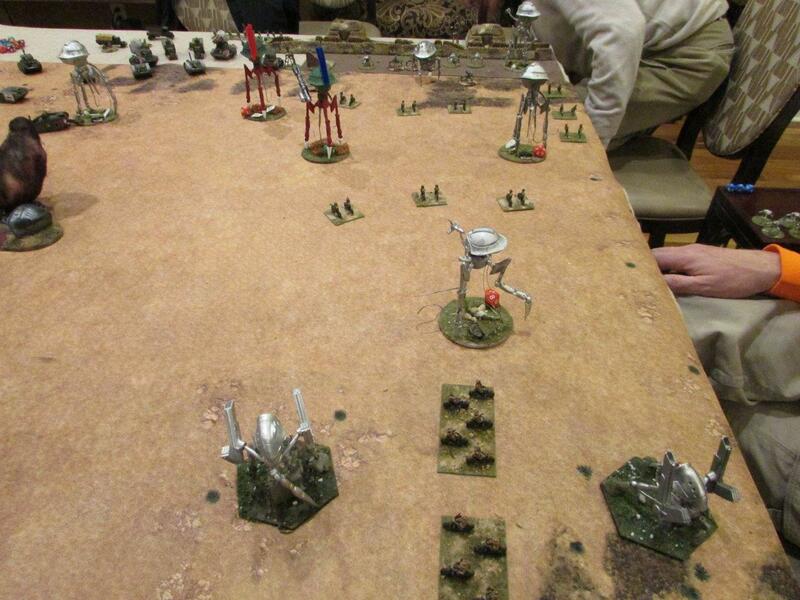 A wave of drones are only 12" from the defense zone, while the line of tripods are only 24" away. 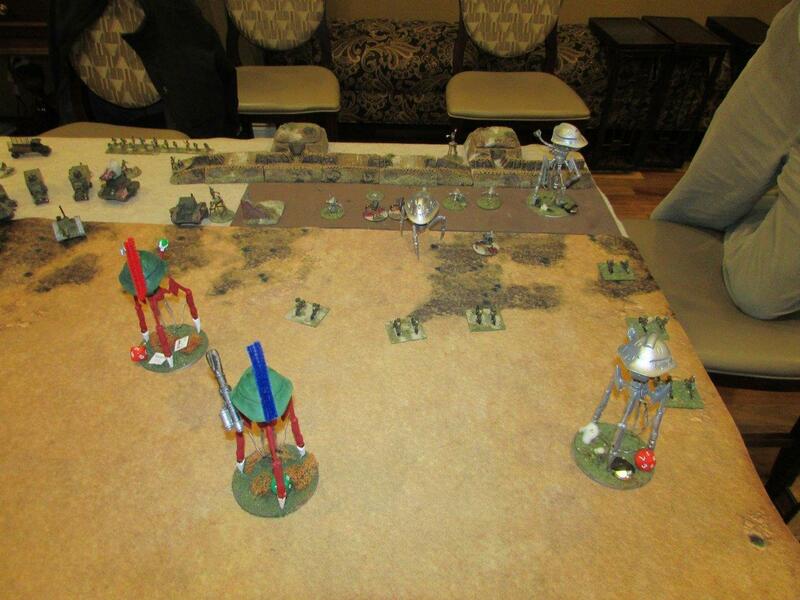 The Grenadier tripods are way in the back. 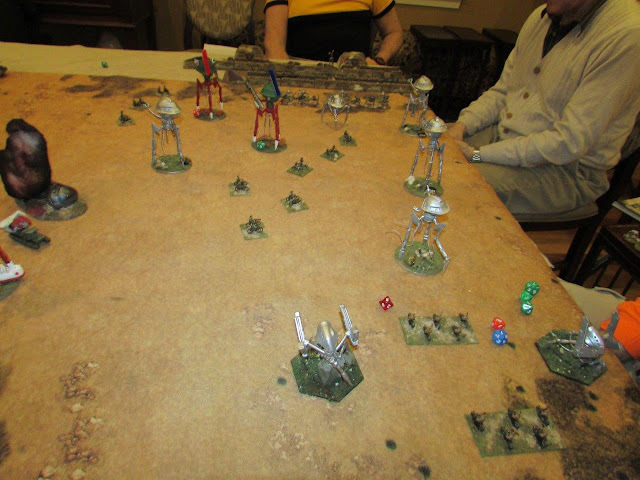 The Martians win if they defeat the Tyler Defenders, and are not defeated themselves by the beginning of their turn 7. The Texans win if they defeat the Martians by the beginning of the Martian turn 7. The status of the Tyler defenders do not effect the Texan victory. All other results are a tie. 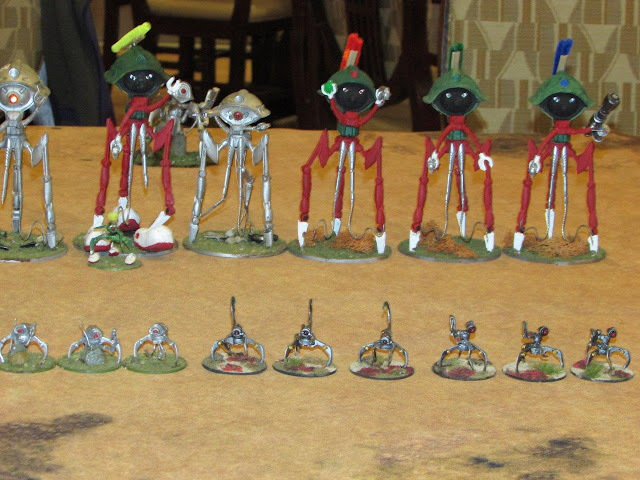 East of Tyler, the Martians mass for the attack. To their east, the 3rd Texas Armored Brigade arrives. The closeup view of the Martian line. Marvin's paint job is being copied. Additional Martians are code named Huey, Dewey and Louie. 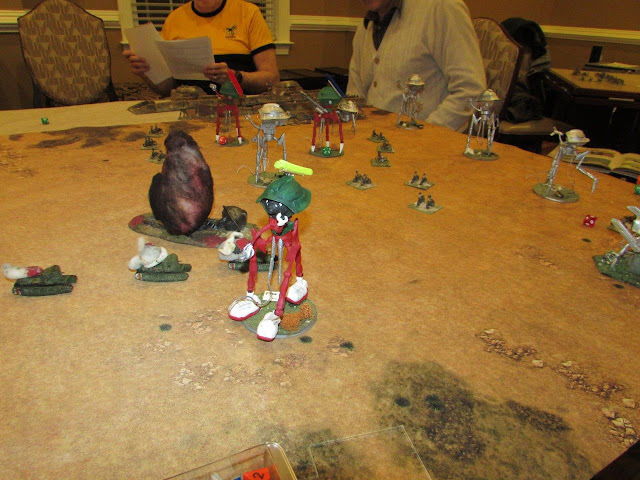 The Martians win the initiative and chose to move first. 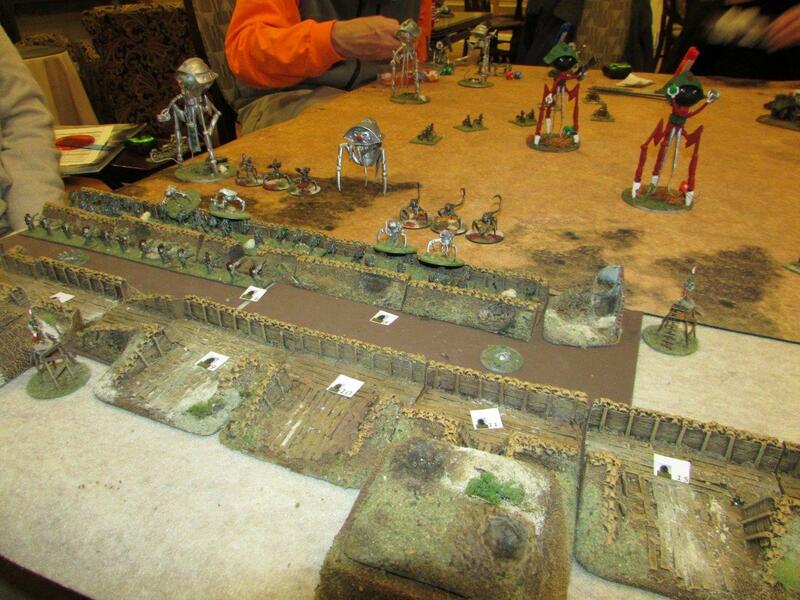 The drones move forward towards the trench lines, while the tripods disperse to a more than 6" apart pattern. The Tyler defenders are quiet as a mouse in their hidy holes. Heat rays dance too and fro across the defenses, Each one fails to find their foes untill the last puff finally reveals a single infantry company. Marvin and Louie sweep the lines of motorcycles, but only cause one platoon to be lost. As the drones charge forward, more defenders are revealed. 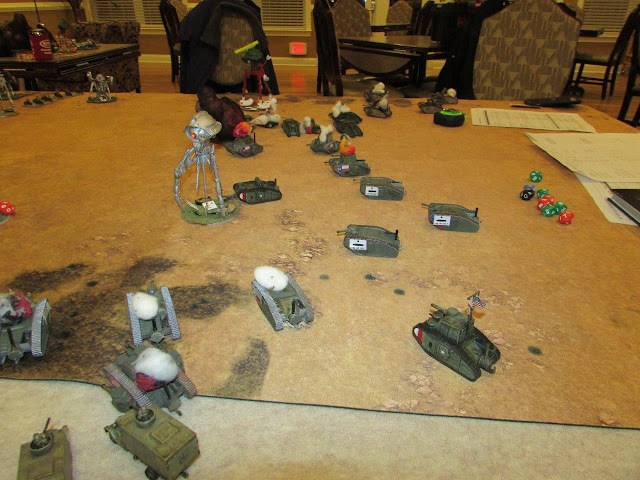 On the bottom of the 1st, the Tyler defenders charge out from their trenches, destroying a couple of drones. Their work done, they quickly retire back to their trenches before the surprised tripods can react. 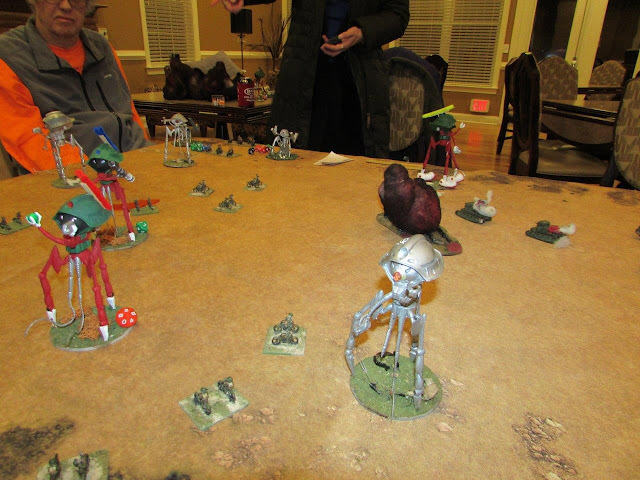 The Humans win the initiative, and elect to move first. 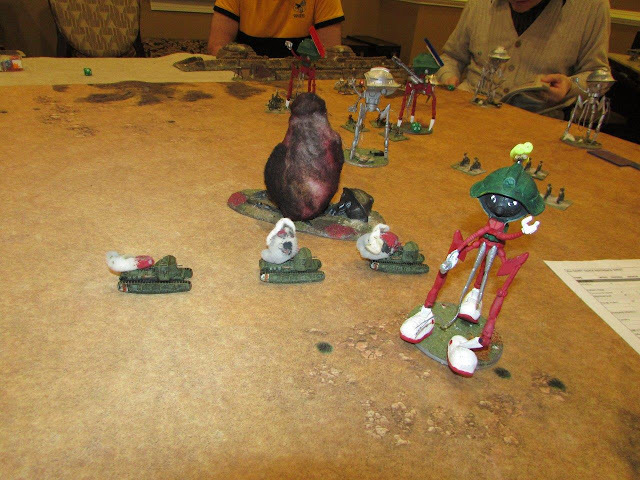 The Rough Riders penetrate the Martian forces and run circles around Huey and Dewey, entangling tow cables around both. 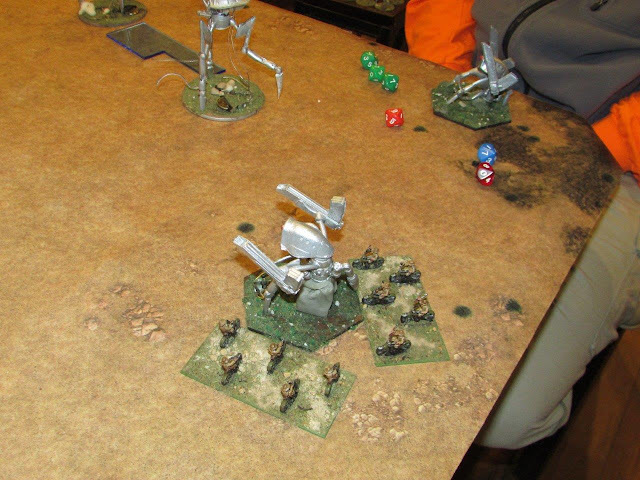 Emboldened by their success, the Tyler defenders again assault the drone line, destroying another. The Whippets try to sneak past Marvin and Louie. 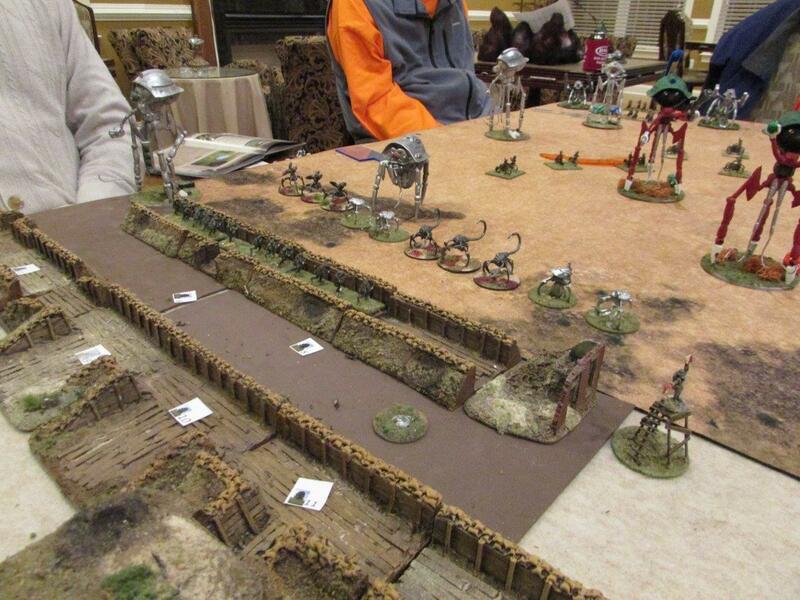 Using command points, these Rough Riders raced across the desert, entangling a grenadier tripod. Texas Longhorns line adjust their sites on Louie. And find that sweet spot. The desert is illuminated by a second sun, and when the flash is cleared, the Whippet tanks were all burning. Their entanglements completed, the Rough Riders disperse, awaiting vengeance of the heat rays to follow. The Martians decide that they are already in range of their target, and movement is unnecessary at this time, and the damage has already been done. They ignore the motorcycles, and concentrate on the targets in the fortifications. 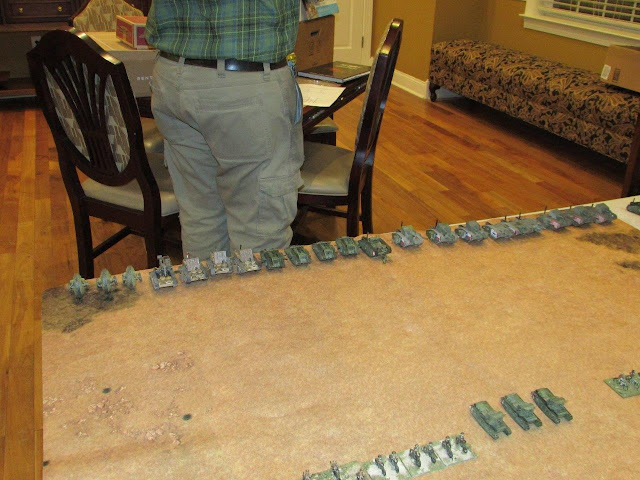 The Third Texas Armored Brigade in forward positions. Marvin sweeps the Texas Longhorns, destroying one. The drones begin their assault on the front lines. 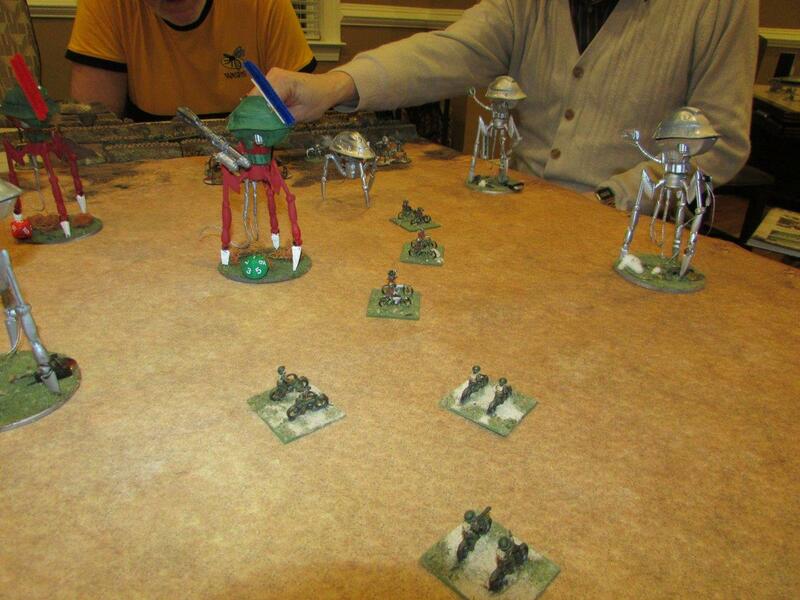 They are assisted by grenadier tripods and assault tripods with black dust and green gas. A couple of platoons are killed, but overall the line holds. 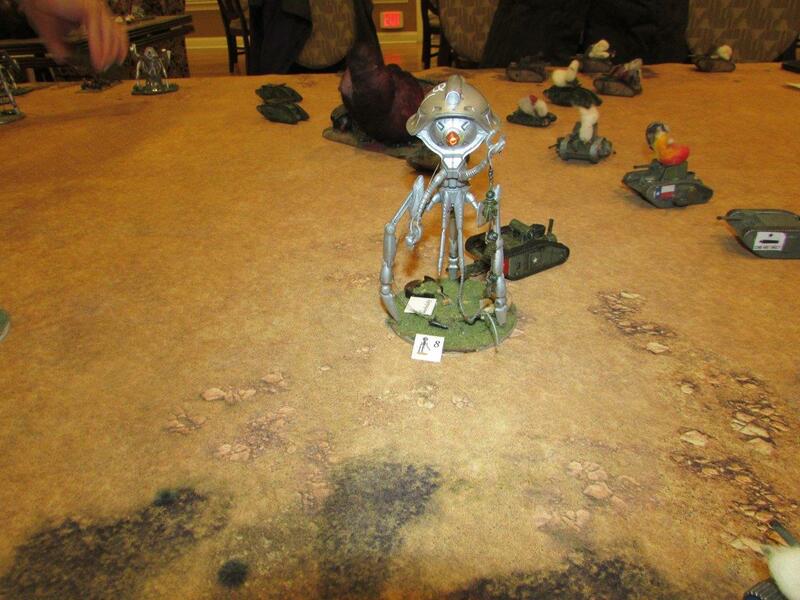 An assault tripod crosses the line and triggers a trap. When the dust settles, it is revealed to be undamaged. No one would have believed how wide spread the battlefield would be, or how effective a large force of motorcycles could be. 4 tripods are wrapped in cables and are vulnerable. The Humans win the initiative and elect to go first. 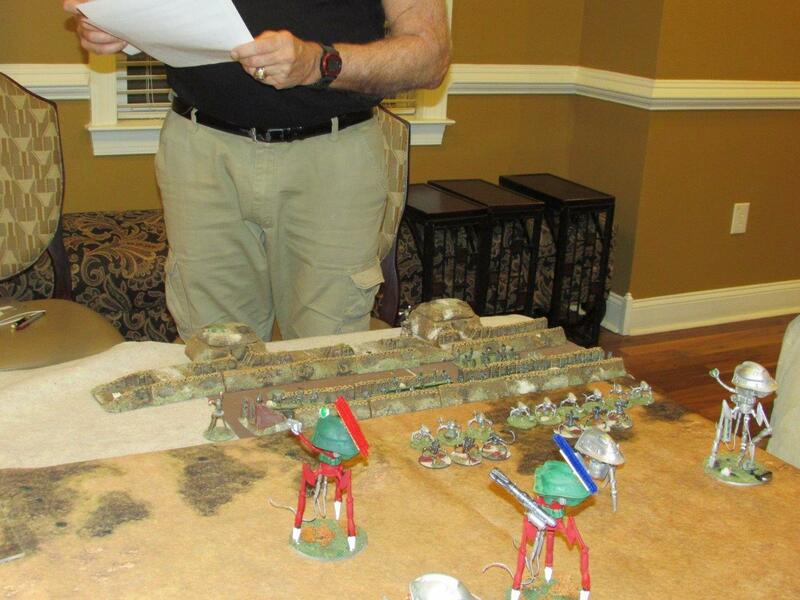 The Texas 3rd Armored Brigade divides up and surrounds Marvin and an immobile tripod. 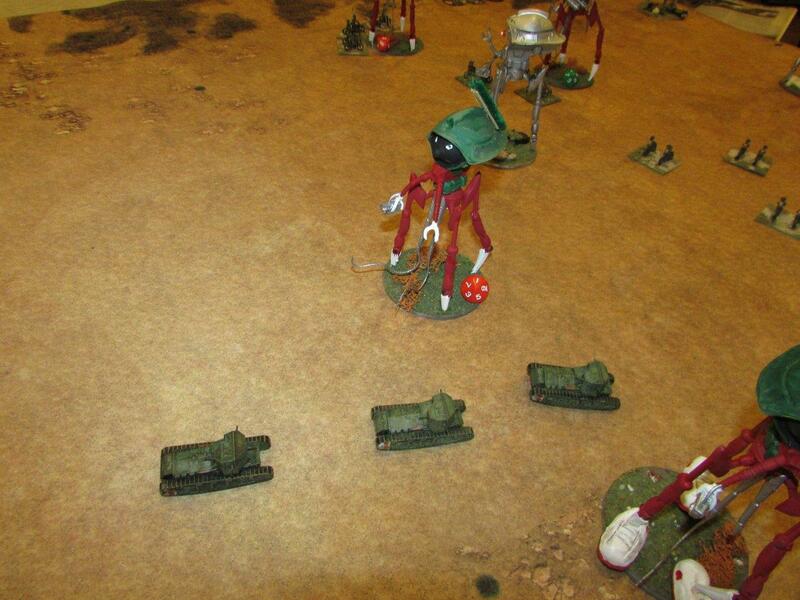 Despite the enormous amount for fire poured into the Martians, they continue to stand with only minor damage. 15 shots with 4" guns, 9 more with heavy machine guns, and just a couple of hits. The Martians renew their assault, clearing several companies of men from the trenches. The Tyler defenders are one unit away from breaking. Shifting targets, the Martian begin to focus on the 3rd Texas Armored Brigade. 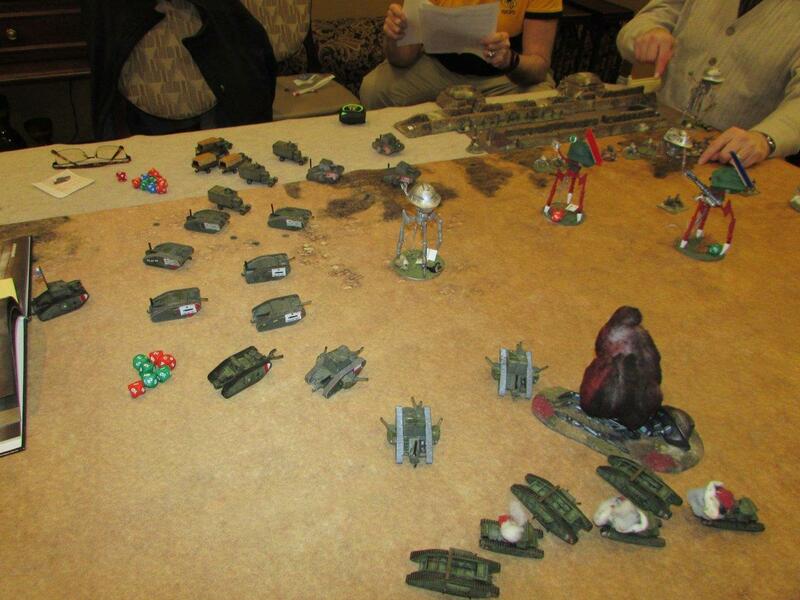 Destroying a platoon of Mk III's and damaging the other. 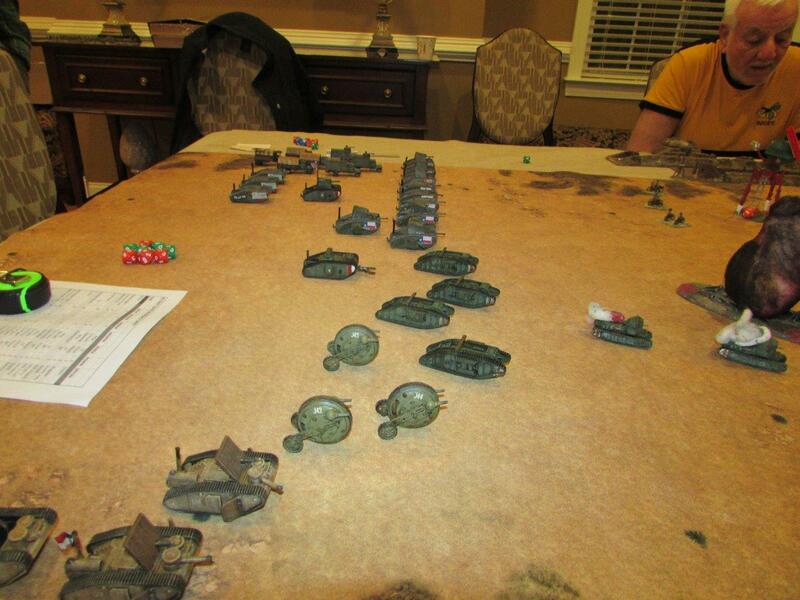 The Longhorn platoon was reduced to one effective tank. 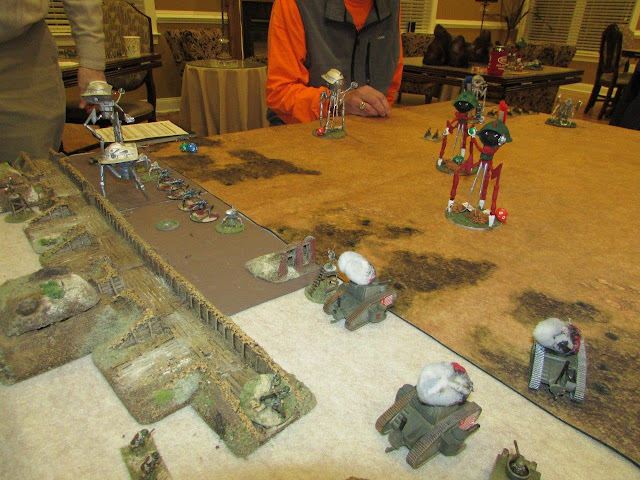 A company of Rough Riders decide to support the Tyler defenders, and gun down a couple of drones. Out of the smoke charges a clamp tank, immobilizing the tripod. Leaking fluid from a dozen holes, Marvin continues to wreck vehicle after vehicle. The Rough Riders, have tangled every tripod in the rear areas, and are now settling in to just shooting. But they are too lightly armed to be effective. The defenses have been cleared of humans, the Martians try a new tactic of occupying them. 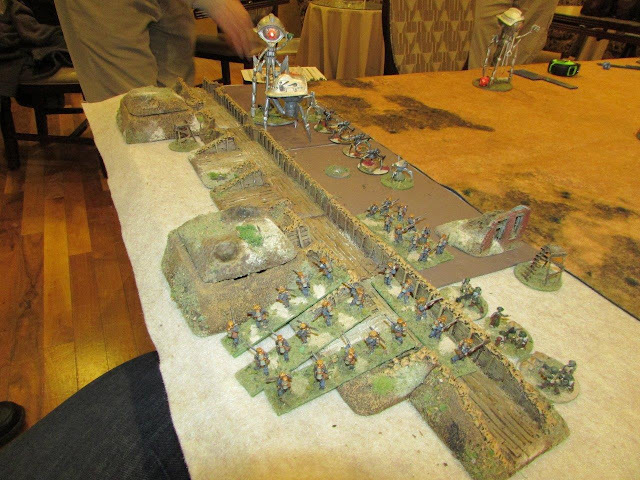 There was a valid reason for this, the drones get the same +4/+4 defense out of the fortifications as the human infantry did. And while the drones have lost 7 of their number, no units have been lost yet. 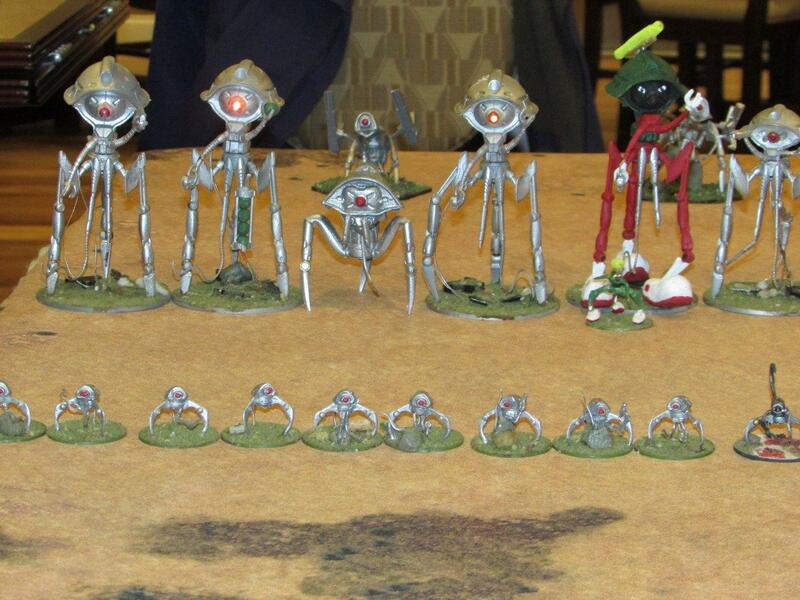 If the Texans managed to destroy all the drones, that would be 5 of the 8 units required to rout the Martians. 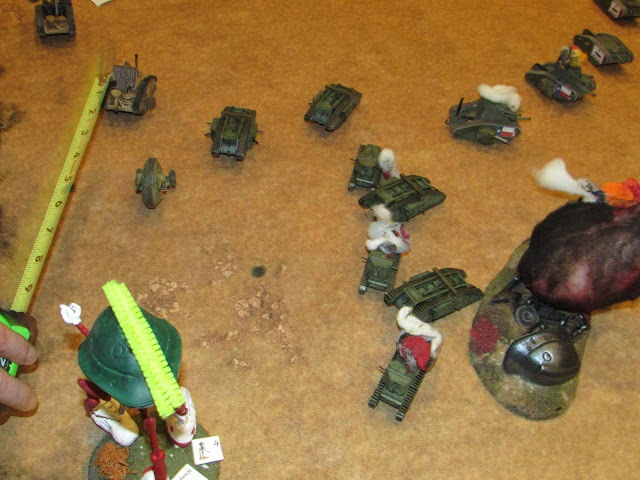 An impressive view of the carnage. 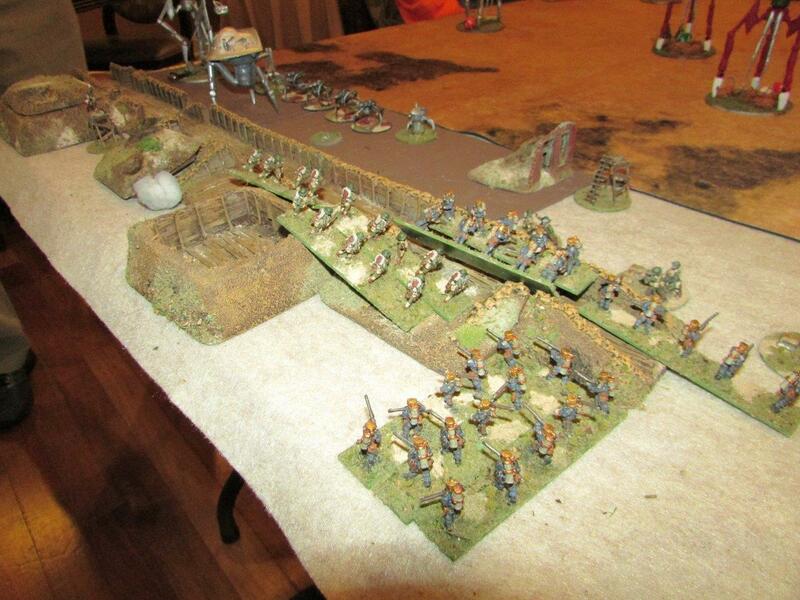 The infantry of the Texas 3rd Armored begin to debark. 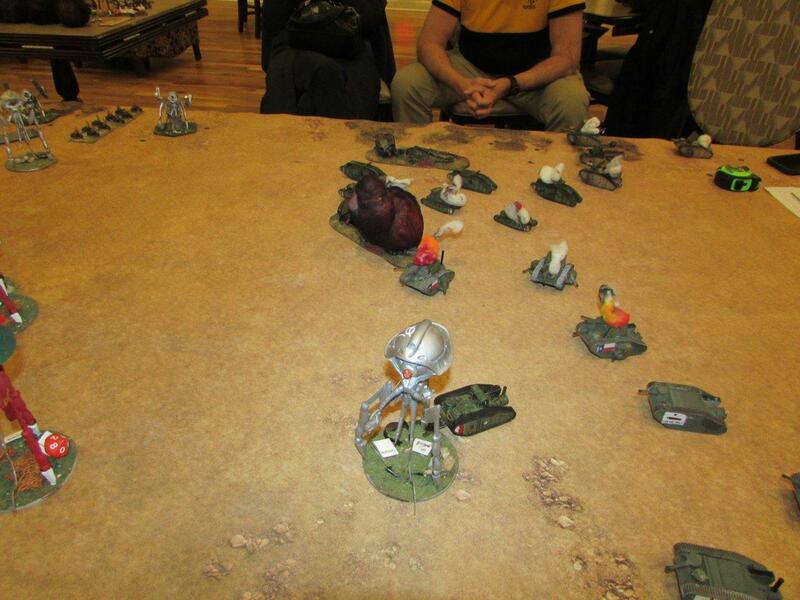 The Mortars start lobbing shells, and score a hit. 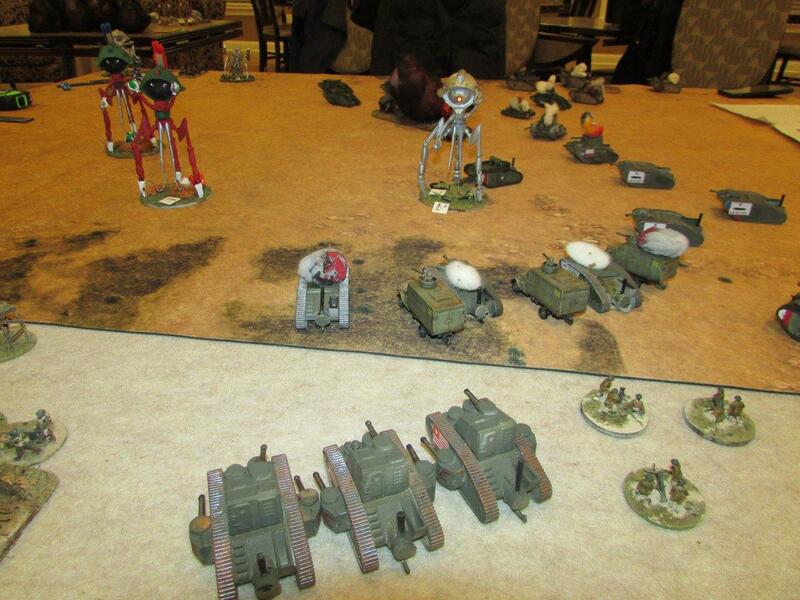 Mk II's and machine guns also fire at the immobile tripod, scoring two more hits. Huey destroys the last Mk III. Marvin's armor has been absorbed all it could and has collapsed under its own weight. 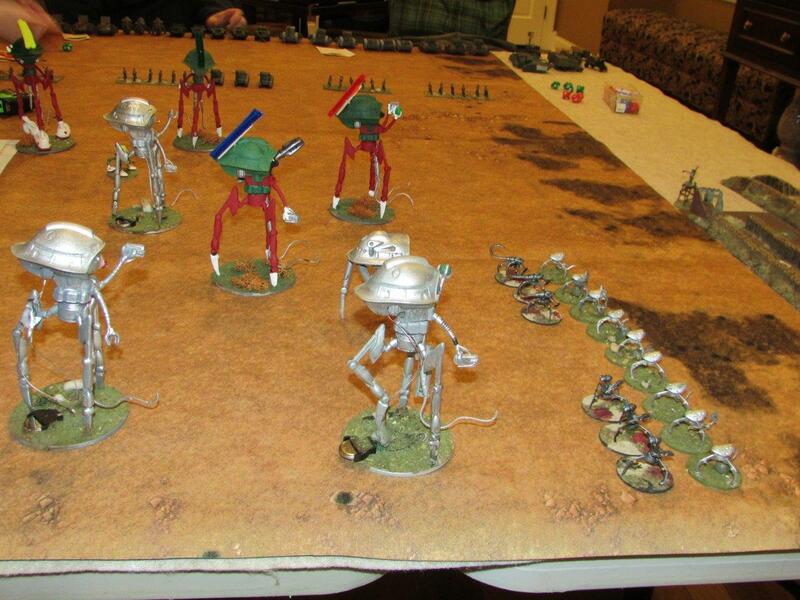 That is 2 of the 8 tripods needed to win. 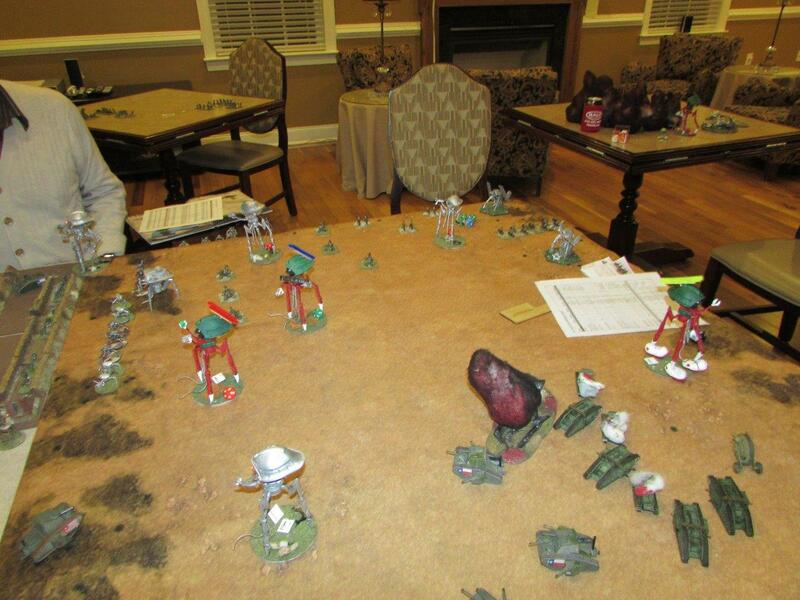 The mobile infantry has arrived, and begin to invest the trenches. Huey takes more punishment from the heavy machine guns and suffers a weapon hit. All this effort is too little and too late. The Martians took time out and have obliterated most of the motorcycles plaguing them since turn one. 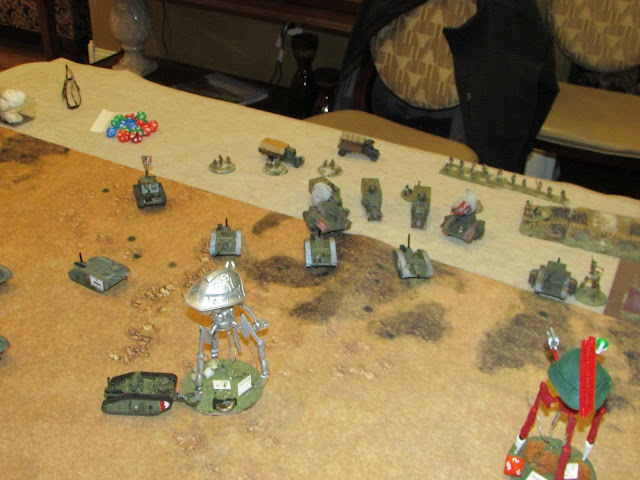 The 3rd Armored brigade has 8 units destroyed, 10 are required for it to break. The MVP of the game. 8 hits, crawling with humans all over it, and still shooting. 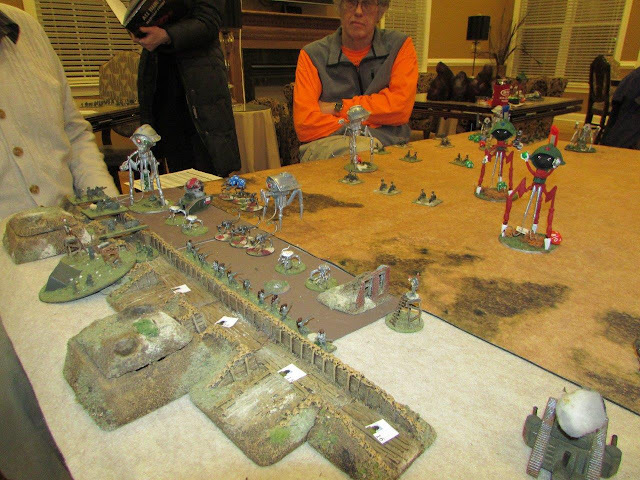 Getting ready for the assault, but the foot can't move fast enough. American Industrial might brings on replacement Mk III's. 4" shells explode all round Huey, causing minor damage. 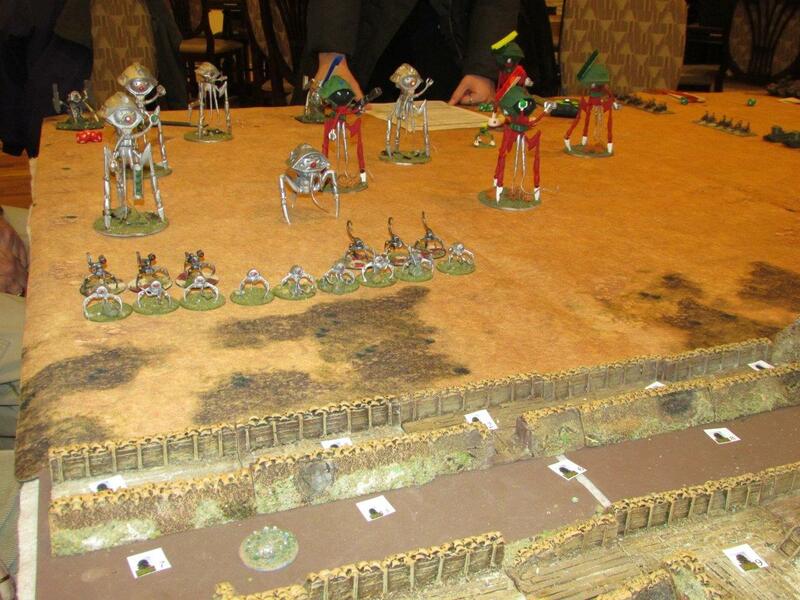 The grenadier tripods target the infantry in the trenches. A full company of men died choking on the black dust. As its number of units destroyed reached 10, the morale of the Texas 3rd Armored Brigade was crushed and retreated from the field. Their only consolation was that there were very few tripods capable of pursuit. And so the core strength of the 3rd Armored was preserved, and would fight again. Riveting narrative. 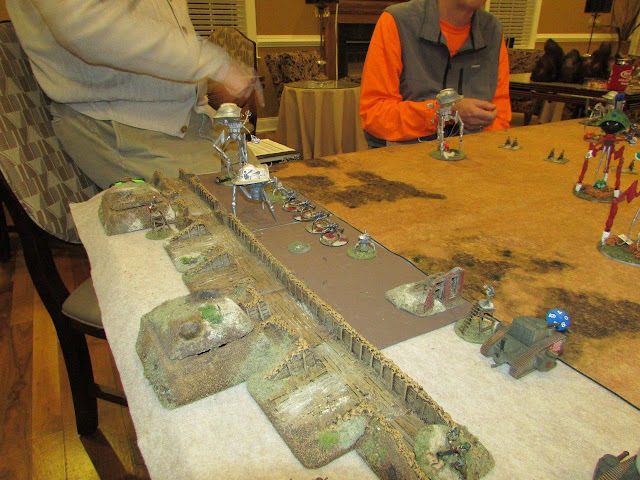 More miniature games should use motorcycles. Though it is sad to see the lush pine forests of east Texas reduced to sand. Must have been the heat rays! 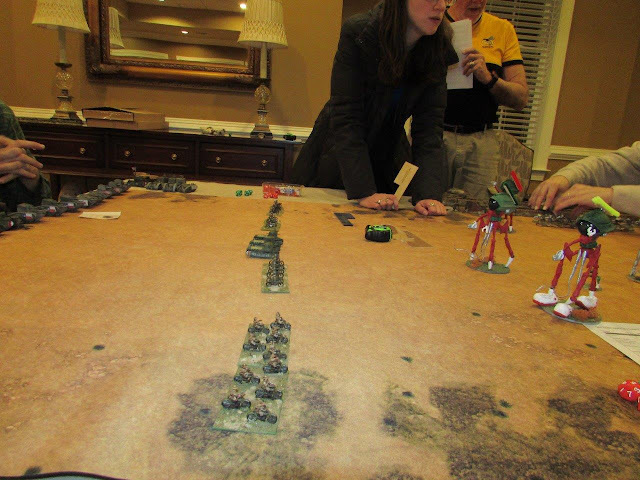 Is the terrain surrounding Dallas more forest? If so, I have fallen victim to my prejudices. Daniel, feel free to update me, as there will be another fight on the western pincer movement to defend Fort Worth. I don't think you could use it in hell any more." To make a good hell," and thus he succeeded. And put an addition on jack rabbits' ears. "I've a hell on the inside as well as without." Consider yourself to have a standing invite! 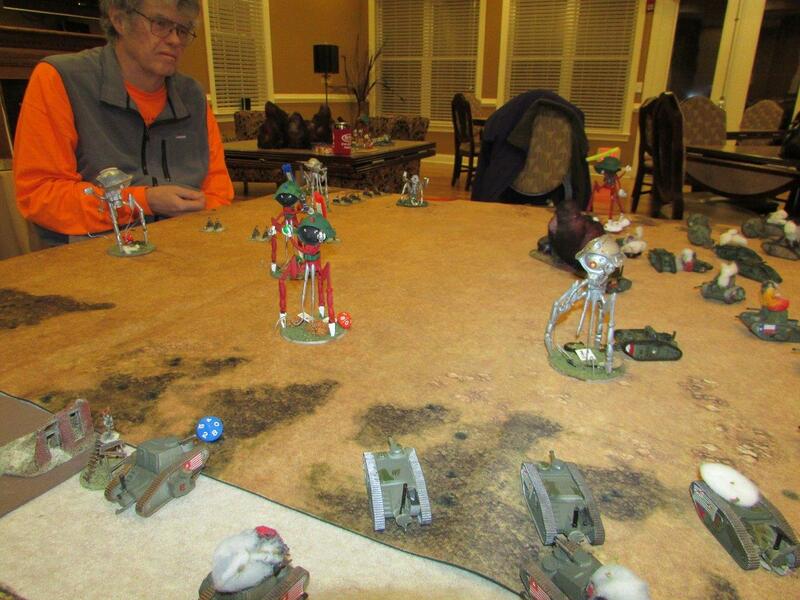 We meet every week on Wed and play a variety of games. One of us shows up early and does the set up. The rest show up at 7 and play. I'll send directions via your email address and see you next Wed.
Hi Phil, Wonderful poem. People expect all Texas to be desert. No big deal. When Europeans arrived, North Central Texas (where DFW is) was a series of alternating bands of forest and prairie. Each band being 15 to 30 miles wide. Bands running north and south. That pattern would have roughly prevailed during the war, but west of Fort Worth it is much less forested than near Tyler. Rainfall decreases the further west you go. 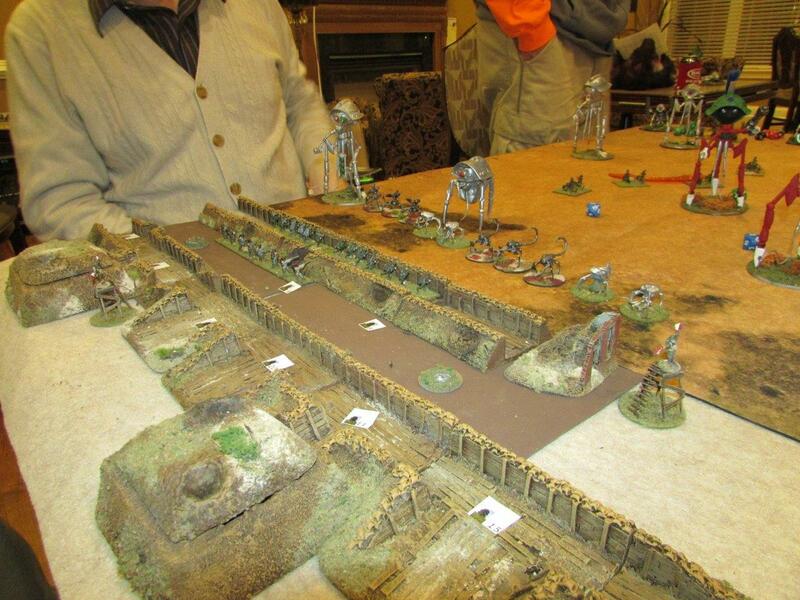 The rivers and streams throughout are wooded and might make for some nice defensive lines - adding something like that to your existing terrain would be rather faithful. Can't wait to see the nest AAR. Best of luck.